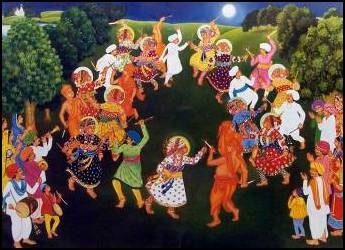 Maha-Raas in Vrindaavan and various parts of Gujarat – a day and night of great celebration for followers of the bhakti cult who worship the twin dieties of Radha-Krishna on this occasion. Lord Krishna is said to have spiritually liberated “uncountable” number of Gopis or Raasikas on this day by giving them the gift of the supreme (-maha) form of bhakti or raas. The occasion is celebrated with daandiyaa raas and garba dances performed by devotees through the night on this occasion as they worship Lord Krishna. “Ko Jaagriti” Poornima in Maharashtra, Bengal and Orissa. According to legend, Goddess Lakshmi visits her devotees on this night to test who is truly dedicated to her – and she asks the question – ko jaagriti – who is awake – and blesses those that she finds awake! In order to remain awake to receive the Goddess, her devotees stay up all night and play games like chess so that they don’t miss out on Lakshmi when she comes to their homes. The full moon on the occasion of Sharad Poornima is said to have great healing and health-giving powers. A traditional way of receiving these powers is to cook an offering of some flat-rice in milk, add some dry-fruits (almonds, raisins etc.) and then expose this kheer to the rays of the moon. The moon is said to provide special spiritual energy on this night to those who eat this offering as prasad. The autumn full moon inspires many outdoors festivals of arts – poetry, folk theatre, dance and music throughout India. 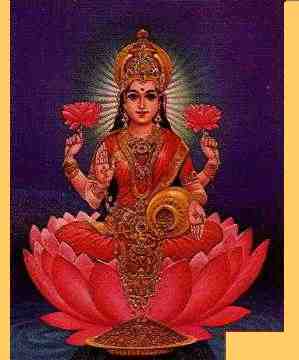 Of course, the patron Goddess of all arts, Goddess Saraswati is also worshipped at this time. Do you have any special traditions to celebrate Sharad Poornima? Please share with us in the comments section. Namaste! Note: This post is part of our festival archive. Please share if you enjoyed it. Namaste! However Stutis and Prayer are for everybody,.. please help me out with Saraswati Prayer. From where did u extract the mantra?? P.S it is not good to chant any mantra without being initiated,..plz keep that in mind. This soooooo beautiful. I am a writer so I chant to Her to say ‘THANK YOU’ for this gift that I share. I work in this gift to bring/share hope, beauty to Life. I am learning more and more as I read the infomation that you send out and I am deeply grateful. Thank you, lifetime after lifetime. Namaste! hi thank you for your website it is to good i am learning how to do laxmi prayer lord shiva and other prayer please play more cd on shiva and other gods and goddess please teach me more about prayer keep up the good work and let the people learn about peace in our world.thank you lots of love maliga reddy south africe.